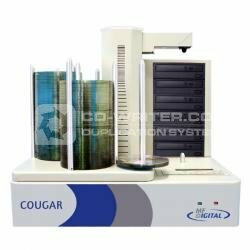 New from MF Digital - the Cougar series represents a single high volume 6 drive DVD CD duplicator with integrated Windows 7 Pro PC. Designed for high volume the Cougar is cost effective and ships with unlimited network client support for a powerful, flexible and expandable system. Cougar is designed, developed and manufactured in the USA with worldwide support. Hi-speed 24/7 operation: Able to perform constantly 24 hours a day, 7 days a week without fear of overheating with quick reliable robotic operation. Proven Technology In business over 30 years and designed and manufactured in the USA our systems are renowned for their stability, performance and reliability. MF . Digital . Cougar . CD . DVD . 6-Drive . High . Speed . Robotic . Duplicator .